Late morning and busier than I expected with a few groups in enjoying a late breakfast or early lunch. Half hour stop off whilst a break of journey on Ensignbus's X81 vintage running day route from Tilbury to Shenfield, with the bus stop conveniently located outside the pub. Freindly welcome I sat at the bar but soon joined by a few others. 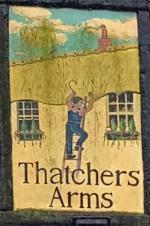 Brentwood - Thatchers Ale 4.10 House beer, barmaid pulled several pints through until it cleared, dark malty ale with a powerful oaky whisky flavour, good condition and carbonation. The pub is found in Great Warley, Essex, CM13 3HU. In Warley Road a detached house often hosting live music. We have visited this pub once, seen 4 different beers and tried 1 of them.